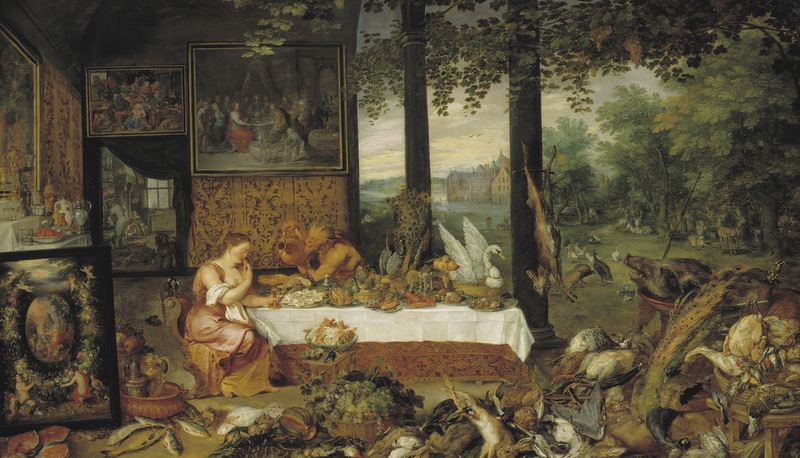 The "Five Senses" is a set of Allegorical paintings created at Antwerp in 1617-1618 by two Flemish masters Jan Brueghel the Elder (Dutch painter, 1568-1625) and Peter Paul Rubens (Dutch painter 1577-1640), with Brueghel being responsible for the settings and Rubens for the figures. They are now in the Prado Museum in Madrid. 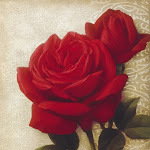 They are all painted in oils on wood panel, approximately 65 by 110 centimetres (2 ft 2 in × 3 ft 7 in) in dimensions. 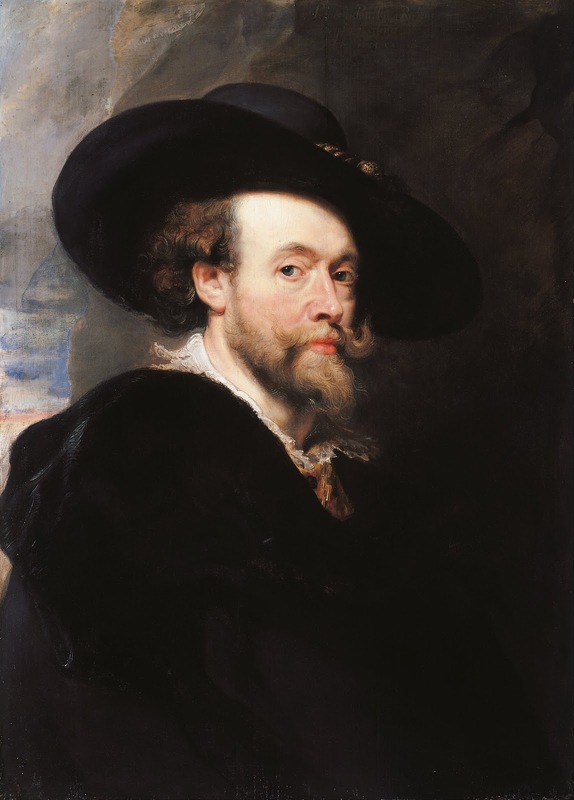 The series constitutes one of the best known and most successful collaborations by Brueghel and Rubens, who were close friends. The allegorical representation of the "Five Senses" as female figures had begun in the previous century, the earliest known examples being the Lady and the Unicorn series of tapestries, which date to around 1500, but Brueghel was the first to illustrate the theme using assemblages of works of art, musical instruments, scientific instruments and military equipment, accompanied by flowers, game and fish. 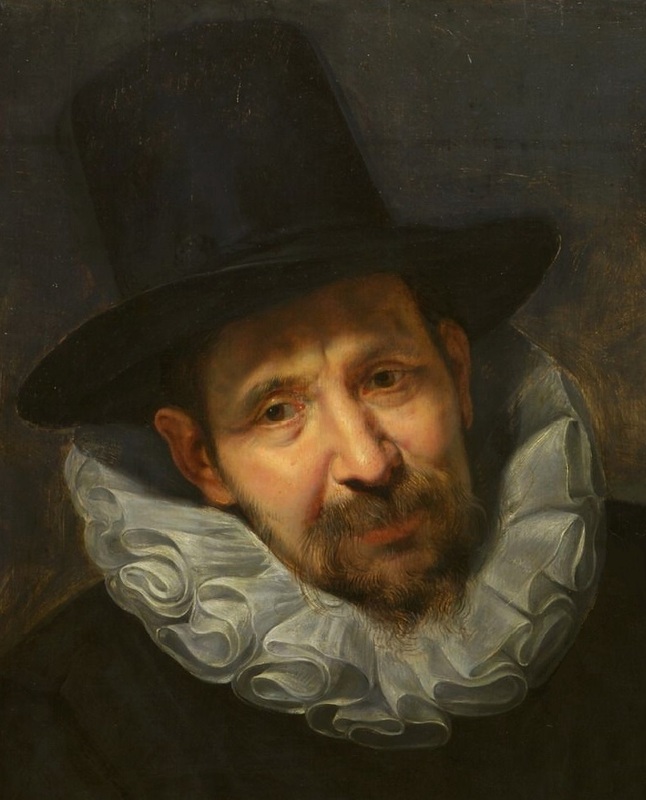 His approach was widely copied in later Flemish painting. 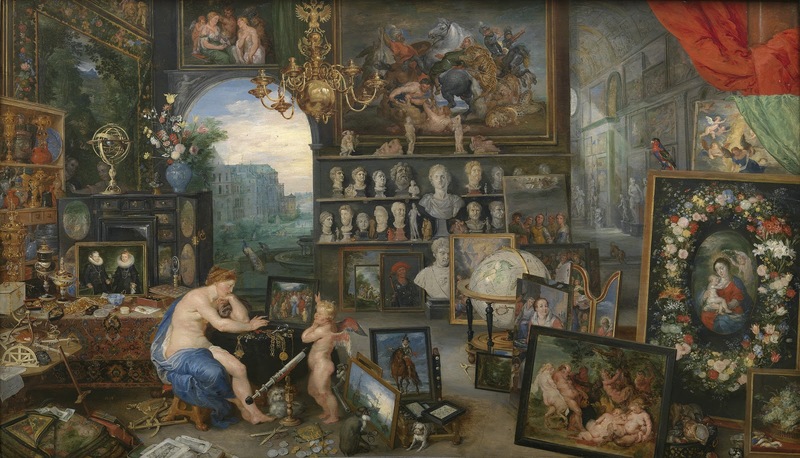 This set of paintings on the five senses - Sight; Hearing; Smell; Taste; Touch) was one of the most successful collaborations of Peter Paul Rubens and Jan Brueghel The Elder. 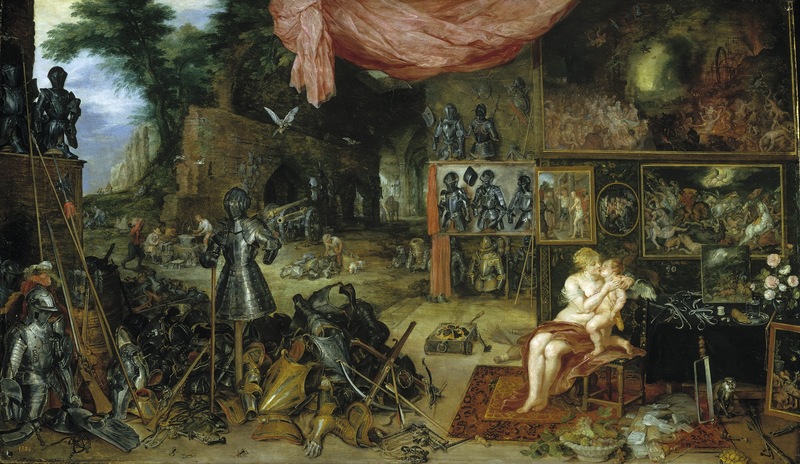 Rubens placed his figures in the magnificent courtly scenes created by Brueghel as settings for these allegories of the senses, resulting in a series of enormous quality and esthetic appeal. The subject was widely employed in Flemish painting. 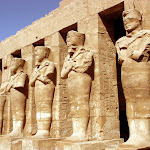 Sight was considered the most important of the senses since the time of Aristotle. Here, Cupid shows Venus a painting on a Christian theme, The Healing of the Blind Man, which alludes to the recovery of sight through one of Christ's miracles and thus touches on both physical and spiritual vision. The presence of a canvas with Saint Cecilia, a copy of Raphael's original, alongside some Roman busts, recalls the soul's introspective vision, an image of chastity and virtue. 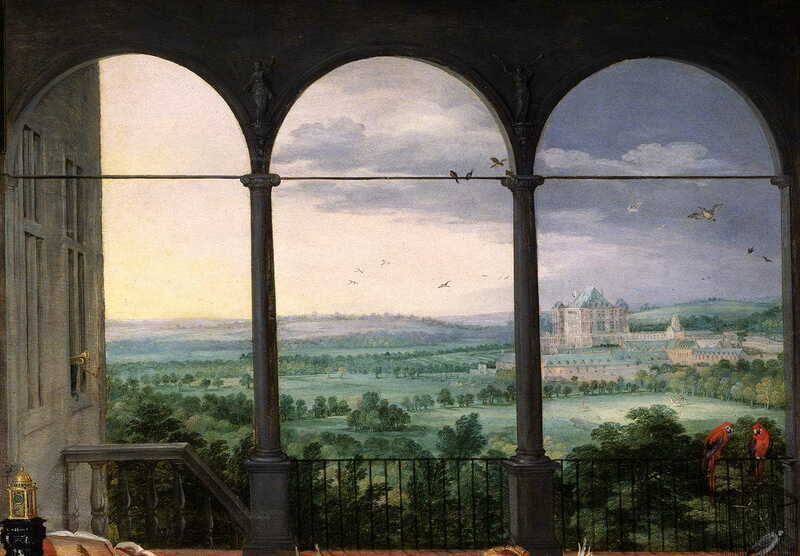 Jan Brueghel was a protégé of the Archdukes Alberto and Isabel Clara Eugenia, and in this work he includes their portraits and a view of their Palace at Mariemont. 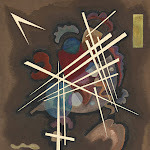 Music, which is perceived through hearing, is the protagonist of this composition. Venus plays the lyre and sings, accompanied by a cupid. The stag at her side symbolizes hearing, as it love music so much that it lies down to listen. On the pavement in the foreground is a rich still life of musical instruments and scores, on the left; and hunting calls, on the right. The symbolism of hearing is strengthened by the pictorial representations that adorn the room's walls: Concert of the Muses, Orpheus Taming the Wild Beasts with Music, The Annunciation and Announcement to the Shepherds, on the top of the clavichord. 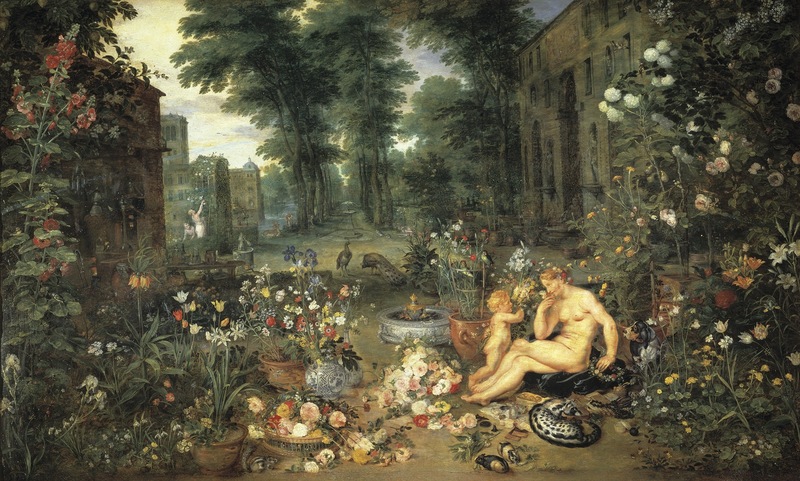 The figures of Venus and Cupid stand out in a paradisiacal orchard with a variety of flowers, including lilies, roses, hollyhocks and tulips. This garden is a testimony to the Flemish love of flowers, a passion shared with Isabel Clara Eugenia, who ordered the planting of an enormous number of flowers and fruit trees evocative of her homeland. Their fragrance triumphs over the disagreeable smell of the civet cat curled up next to Venus. Not even the fine nose of the dog notices its presence. It is signed on the lower edge, at the right. A satyr pours nectar of the gods into a sumptuous goblet held by a nymph leaning on a table full of food, alluding to taste and its relation to the idea of abundance. In this apparently pagan, lustful and animal-natured setting, the garland and the three paintings in the background bear a moral and Christological meaning. 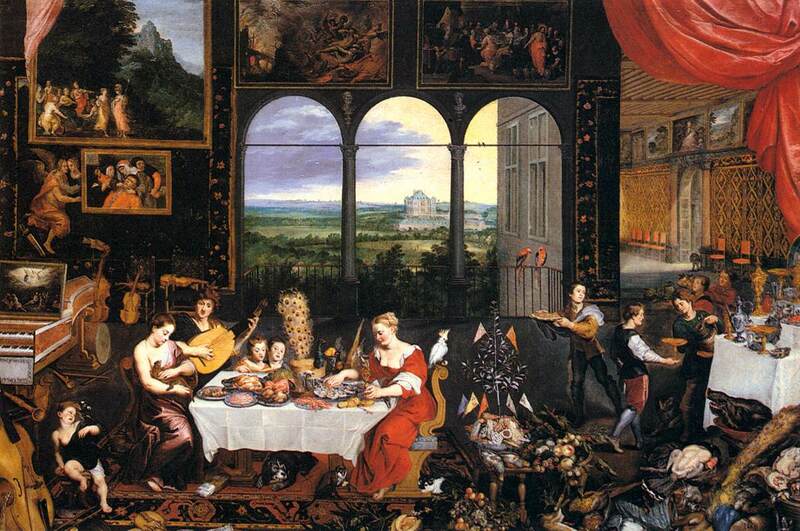 The Offering to Cibeles reveals a disproportionate fondness for abundance and wealth; The Abundant Kitchen, near the top, while less refined than the palace tables, alludes to human weakness in the face of gluttony, which is more moderate in the Rustic Kitchen and The Wedding Feast at Canna. - Touch, 1617-1618A group of blacksmiths protected by a wall in ruins, a visual metaphor of Vulcan's forge, cast metals into cannons and other weapons while a falcon flies over them with its prey. Birds, which usually perch on an allegorical figure's hand, are signs of the iconography of touch. In occasione della visita degli arciduchi ad Anversa nel 1618, il senato cittadino volle mostrare ai reggenti un saggio dell'alto livello raggiunto dalla pittura nella loro città e così affido a Jan Brueghel il Vecchio il compito di dipingere una serie di allegorie che rappresentassero i cinque sensi; Brueghel chiamò a collaborare all'opera l'amico fidato Peter Paul Rubens, al quale si devono tutte le figure umane o semiumane inserite nelle cinque composizioni del ciclo. 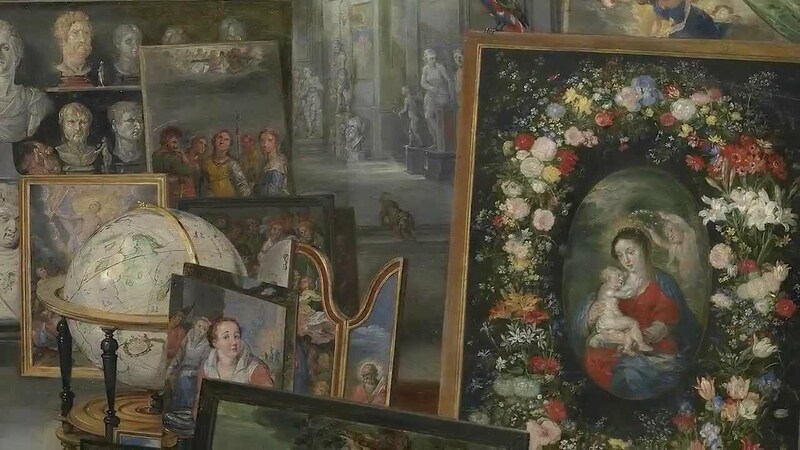 - La Vista, 1617il senso della vista raffigura una vera e propria camera delle meraviglie in cui ogni cosa non porta in sè solo il "vedere" ma anche il capire, l'imparare e l'aver fede. L'opera che la figura sta guardando è appunto La guarigione del cieco; poi il cagnolino accanto al telescopio parla della fede nella scienza, che nel Seicento cominciava a farsi strada. - L'Udito, 1617-1618Per L'udito, naturalmente, ogni sorta di strumento musicale: la musica da fare ma anche sullo sfondo un concerto da camera e molti uccelli di cui ascoltare il canto. 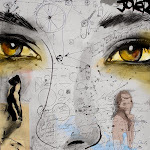 La figura qui, accompagnata dal puttino, appare lieta e divertita, ad indicare che la capacità di saper suonare uno strumento è anche una virtù. - L'Olfatto, 1617-1618Per l'olfatto ogni genere di fiore, in un giardino rigoglioso e anche la figura accurata di un segugio, il cui olfatto era garanzia di caccia. Qui il senso ha una accezione solamente positiva, quando in verità l'olfatto può sentire anche odori sgradevoli. - Il Gusto, 1618 Il gusto invece, è l'unico ad avere un satiro invece del putto: questo perchè la gola era considerato un peccato capitale e quindi un vizio. Oltre a mostrare il mangiare, il desco imbandito chiama anche all'idea del bere, di cui il satiro ne è perfetta incarnazione. Alla parete, il quadro rappresenta Cristo che trasforma l'acqua in vino, incarnando l'idea di un bere con moderazione. - Il Tatto, 1617-1618Il tatto viene ambientato in una sorta di fucina, dove si creano centinaia di armi e armature,che rappresentano il freddo e il duro. La figura stringe forte il puttino per sentirne la pelle morbida. Il tatto, intatti, è il senso migliore per restituire anche la sensazione (duro, morbido, ruvido, caldo, gelido, bagnato, doloroso). I quadri rappresentano il Cristo alla colonna, due giudizi universali, una caccia e una operazione chirurgica ad indicare proprio la capacità di sentire dolore o il calore del fuoco. Insieme alla scimmia, simbolo dell'uomo dall'intelletto limitato, il senso sembra avere accezione negativa. 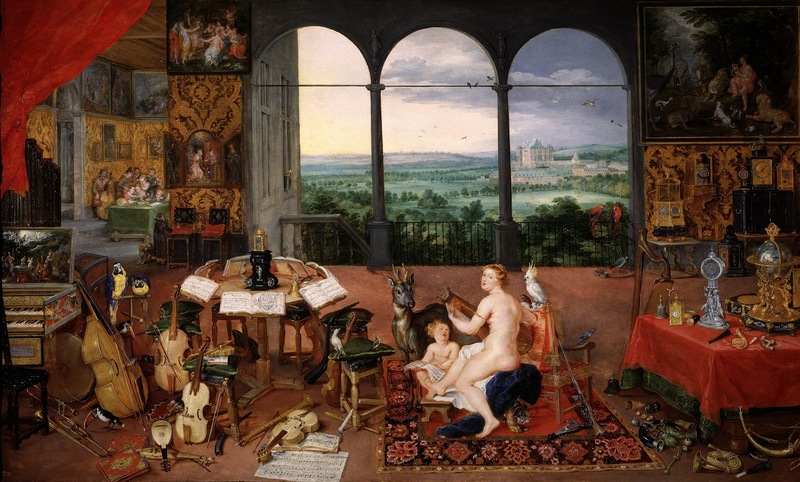 Jan Brueghel the Elder "Five Senses"
- The "Five Senses" are a pair of oil paintings made by Jan Brueghel the Elder and others in 1617–18, at the same time as he was working with Peter Paul Rubens on a series of five paintings on the same topic. 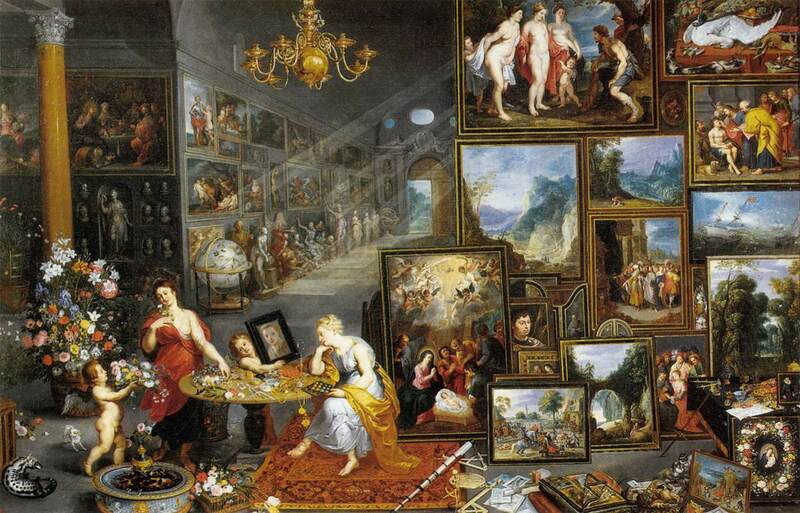 - I "Cinque Sensi" sono una coppia di dipinti ad olio realizzati da Jan Brueghel il Vecchio ed altri nel 1617-1618, allo stesso tempo, mentre stava lavorando con Peter Paul Rubens per la serie dei cinque dipinti.